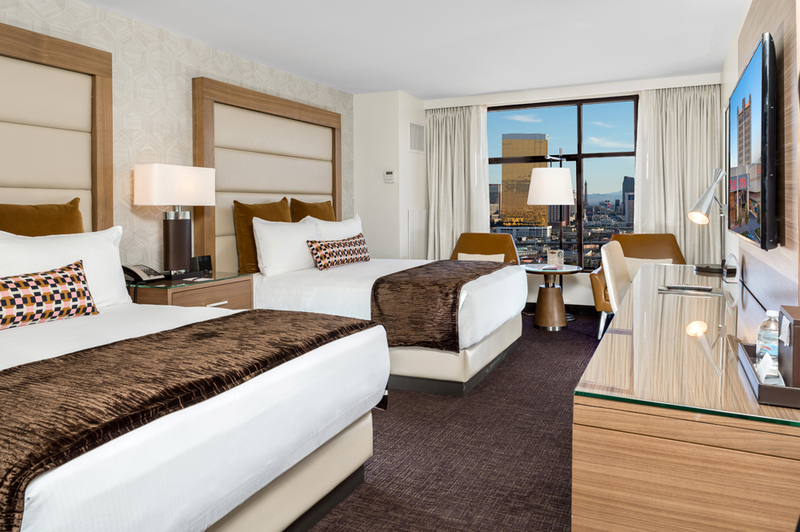 As the newly revamped exteriors and casino spaces emerge, Palace Station Hotel and Casino also boasts a whole new look and feel to the hotel’s guestrooms in the main hotel tower. The new guestrooms and suites exude a residential mid-century modern styling to appeal to both convention goers and millennials. At each level, guests are warmly welcomed into lobbies featuring graphically patterned area rugs with natural limestone borders, while being highlighted by a trio of intertwined hand-blown glass and metal pendants from above. Each guestroom entry, identified by a natural walnut room plaque, is wrapped in a warm walnut wallcovering that transitions into golden geometric patterns overlaid on crisp white walls with colorful modern artwork above. Upon entering each guest room, bright, fresh walls and drapery contrast against plush carpet, and accents and are offset with furnishings made of natural walnut mixed with metals, crisp clean upholstered elements, and bold, graphic patterning in the artwork and pillows. The Calacatta quartz-topped nightstands and spacious work surface have USB charging stations. 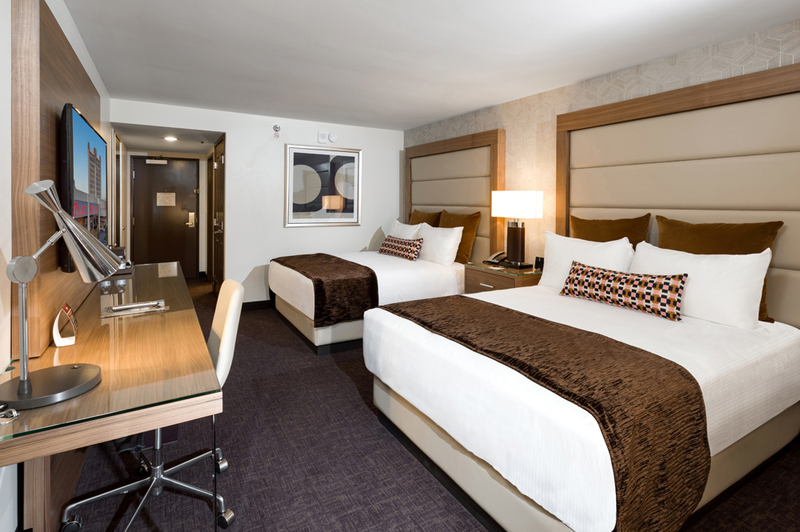 Rooms feature a wall-mounted 55” TV, headboard reading lights, ample storage, and a comfortable seating area. The upper-level suites, with their soaring ceilings and city views, are notable for their comfortable living room settings, with custom media walls and custom wet bars, both essential for entertaining. The boutique-style bedroom settings provide a clean modern statement with sleek upholstered headboards and comfortable seating. Luxurious bathrooms set the suites apart with their ample granite vanity counter areas and custom mirrors. All new parking lot available off Rancho Drive ... Where parking is always FREE! Convenient access to brand-new gaming floor, new table games, and restaurants! Each of the Station Casinos properties offers year-round affordability, excellent value and impressive amenities, but Palace Station also features exclusive hotel promotions to members of the Boarding Pass players club. Check out our online deals to find the very best Las Vegas hotel discounts and specials. For our guests added convenience we provide complimentary shuttles to and from both the Strip and the airport throughout the day. Save on expensive cab rides with a stay at Palace Station! Want to stay in shape during your stay? We have everything you need, from state-of-the-art cardiovascular and weight training machines, to free weights. Fitness center guests must be at least 18 years of age. Send or receive money with the Western Union services located in Palace Station.